Well I am sure that you would agree that does sound rather a little over the top. 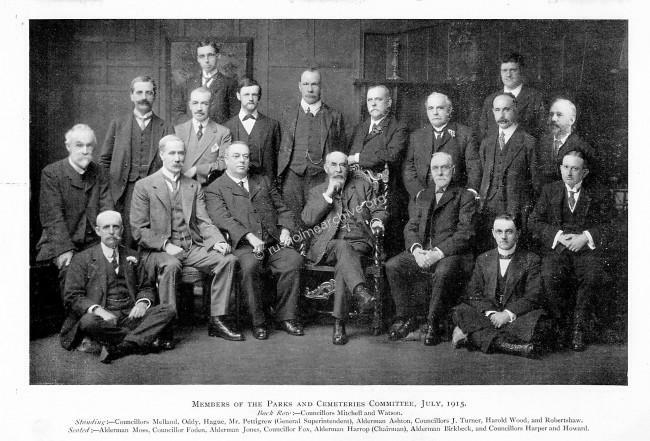 In the photograph below, the Chairman, Alderman Harrop is centre seated in the larger chair, whilst behind him, standing to his left is the General Superintendent, Mr Pettigrew. 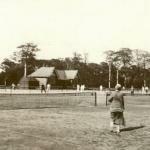 However the Report does give us some very interesting facts: Tennis was very popular, there were46 tennis courts with a total of 24,630 players, averaging 530 players per court. Forty acres was shared by football & cricket players. 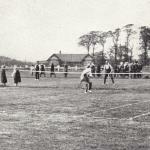 26 football clubs shared 13 pitches, 15 cricket clubs shared 9 pitches. 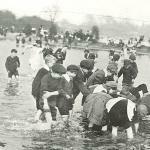 The lake had a total of 57 boats and it was noted ' Girls and women are among the leading patrons of this form of active exercise'! 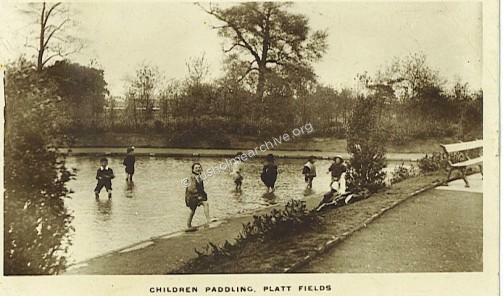 Also during the summer months children from the very poorest and least healthy parts of Manchester were brought to Platt Fields for a day out. 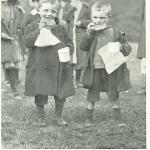 They were led in procession by a band & provided with a picnic enjoying the day playing ball games, skipping, fishing also proved popular. 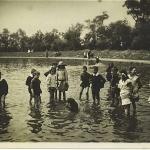 'All the little guests were allowed a ride around the lake on the launches'! 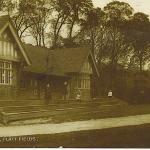 Tennis was very popular according to the 1915 Report and below is the Tennis Pavilion. 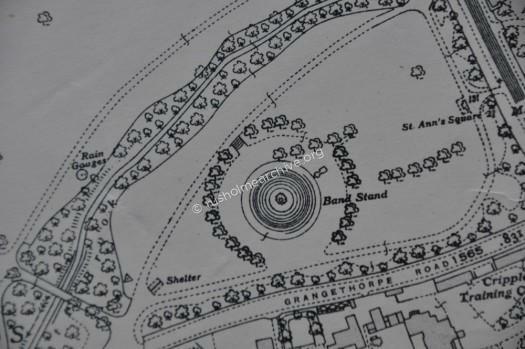 The Bandstand was situated near to Grangethorpe Road. You can see it clearly marked on the map below. 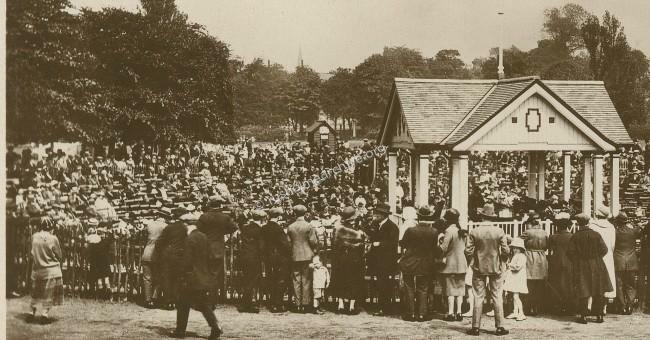 The photograph below of the bandstand is undated but would appear to be from the 1920's (?). There is an edited and closer view beneath, the photograph has been taken looking south and in the distance is the spire of Holy Innocents on Wilbraham Road. 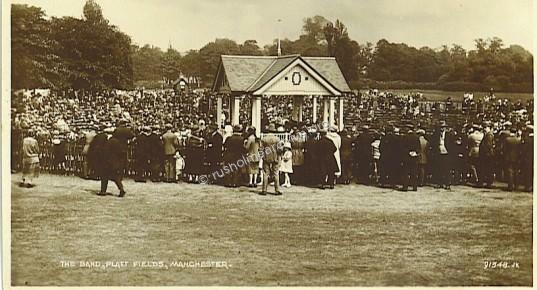 The Manchester Professional Military Band played regularly in the Rusholme parks and would have been here in the Platt Fields bandstand. 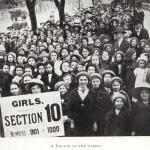 Music in the Park 1910 style. 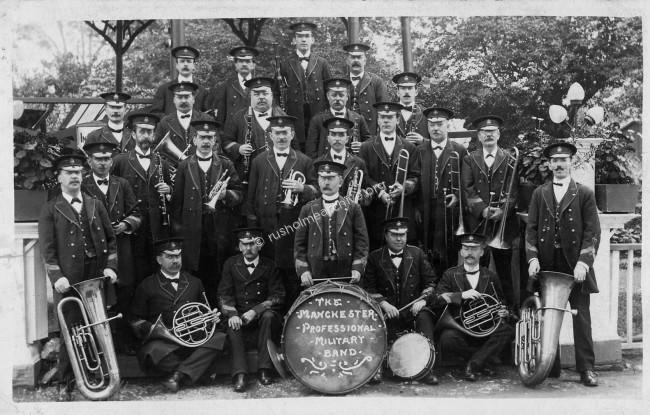 The Parks Superintendent gave an extensive report about the various qualities of the Bands that played in the Manchester Parks. Here he draws attention to the 'Best Bands'. 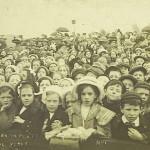 AFTERNOON PROGRAMME—3 to 5 o'clock p.m.
EVENING PROGRAMME—6-30 to 8-30 p.m.